Visit the 13th annual Denver Christkindl Market in the heart of downtown Denver on the 16th Street Mall. Once upon a time, I served an 18-month-long LDS mission in Switzerland and this quaint German Christmas market’s music, food, holiday lights and old-world vendors made me relive the fairy tale. Hadley and I bought handmade Christmas decorations, drank cinnamon-spiced hot chocolate, devoured cinnamon-sugar pretzels as big as our heads from Styria Bakery and sampled gebrannte mandeln (roasted almonds) that had been perfected in a copper kettle important from Germany. We vowed to make a return trip to try maronen (roasted chestnuts), weiner schnitzel and for the line-up of events. Before we left, Hadley bought a horse from one of the glass artisans, proclaiming “This will help me remember this fun day,” a minor miracle for a kid who isn’t exactly the sentimental type. For years, I’ve written about this free skating rink in the heart of downtown Denver on 16th Street Mall but I’ve never done it. Located right across from the Denver Christkindl Market, Hadley and I shopped ’til we dropped and then dropped a few times as we whirled around the ice with the Christmas-tree backdrop under a canopy of white lights. Open daily now through Feb. 16, the skating is free and rentals are only $2 (though every Sunday is a free day for kids). Learn to Skate is offered every Wednesday from 11 a.m.-12 p.m. and every Saturday 8 a.m.-10 a.m.
For the rest of the afternoon, we walked for miles around downtown. We bought umpteen stocking stuffers at Rocket Fizz Soda Pop & Candy Shop on Larimer Square (it was tough to narrow it down the literally hundreds of choices), tasted and bought gourmet olives oils and balsamic vinegars from nearby EVOO Marketplace’s sampling room and loaded up on high-quality spices, herbs and seasonings at Savory Spice Shopon Platte Street. Anyone else sensing a food theme here? My favorite memory of the day was as we were leaving Christkindl Market, a street performer was playing “My Favorite Things” on his trumpet. My daughter and I recently watched this classic movie together and we both spontaneously started singing and laughing at the top of our lungs. 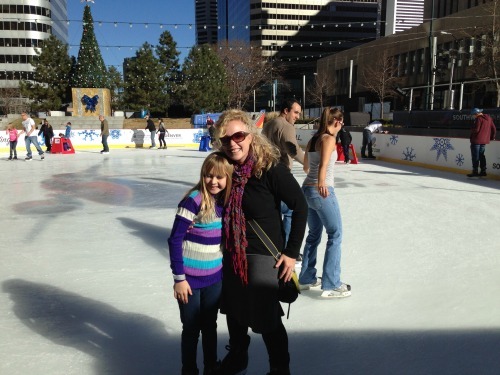 Downtown Denver fun with my favorite girl? That day was definitely full of my favorite things. I’ve been wanting to go to the Christkindl Market for ages. Sounds like loads of fun so I’d better get on it since it ends soon. It really is lovely. We went during the day but I think it would be especially fun lit up at night. sounds like fun. walking down 16th street is fun during the holidays. also love larimer square all lit up. we’re fortunate to have so many great things to do. i love lafame boutique.